SAN JOSE – The Ottawa Senators just keep rolling along. Colin Greening scored twice and Kyle Turris and defenseman Erik Karlsson each had goals as the Senators beat San Jose 4-1 on Thursday for their ninth win in 11 games. Ottawa beat San Jose for the first time since Oct. 18, 2003, ending a five-game series skid, and won its fifth straight road game. "We're very confident right now," Greening said after the Sharks set a team record by getting points in their 11th straight road game (7-0-4). "This shows that we're a very good road team. You've got to be able to get points on the road, especially when we're coming on the West Coast. We have a three-hour time change. This is really a tough place to play. Coming in here and being able to win, especially 4-1, is obviously a testament to how resilient we are." Senators goaltender Craig Anderson stopped 36 shots and improved to 25-13-4 overall and 8-1-1 in January. He withstood a blistering Sharks attack in the first period, giving up just one goal on 16 shots. "We knew they'd come out hard," Anderson said. "They have a history for coming out strong. We just had to weather the storm, try to get through that first five minutes without being too bloodied up from the Sharks. I think for us, we're one of those teams if we can just hang around long enough and play well enough to be within a goal, we always have a chance." Brad Winchester had the lone goal for the Sharks, who were 7-1-2 in their previous 10 games. San Jose coach Todd McLellan, in his fourth season, and first-year Ottawa coach Paul MacLean spent three years together as assistants in Detroit under Mike Babcock. They faced each other for the first time as NHL coaches. Advantage MacLean and the Senators, who won despite being outshot 37-21. "You can see why they are a good team," McLellan said. "They don't need that many opportunities to score." Karlsson put Ottawa up 2-1 at 4:30 of the second with a one-timer from high in the right circle after a Sharks turnover. Turris skated low in the Sharks' zone with the puck, then sent it back to a wide-open Karlsson, who scored his seventh goal of the season and pushed his points total to 45. "I was disappointed with critical moments in the game," McLellan said. "I didn't think we had a lot of polish on our passes. Then the ones that were on the tape, nothing happened after that. The turning point had to be the turnover that led to the odd man rush." Greening made it 3-1 at 14:50 with a power-play goal against a Sharks penalty kill that entered the game ranked 28th in the League. Greening tracked down the puck along the right boards, glided to his left and ripped a shot from the circle that beat goaltender Antti Niemi just inside the left post. Greening gave the Senators a three-goal lead at 9:34 of the third, beating Niemi with a blast from the high slot. It was his 11th goal and capped his first multi-goal game of the season. The Senators won despite playing shorthanded for most of the night. Fourth-line winger Kaspars Daugavins blocked a shot with his left leg in the first period while killing a penalty, limped off and didn't return. Midway through the second period, third-line center Zack Smith landed hard after colliding with Winchester in the neutral zone and left the game for good. "We're going to evaluate Zack Smith," MacLean said. "We kept him out for precaution. Kaspars is hurting, but he's from Latvia, he'll probably be alright. Tough guy." MacLean's entire team showed toughness and resiliency, beating one of the NHL's top teams on the road in another measuring stick game. "It's part of us putting blocks in our foundation and trying to learn how to win games," MacLean said. "When you can do it in tough buildings like this, those are real, real solid blocks that you can put into your foundation. Tonight was a game where we really depended on our foundation and structure to get us through the game, and I thought as the game went on we established it more and more and it ended up being the difference." The Sharks outshot Ottawa 16-7 in the first period and took the game's first seven shots but had to settle for a 1-1 tie after 20 minutes. Winchester, a fourth-line winger, gave San Jose a 1-0 lead at 3:10 with a wicked wrister from the slot that beat Anderson. Center Andrew Desjardins earned an assist, hitting a wide-open Winchester with a pass from near the left wall. Defenseman Dan Boyle, an Ottawa native facing his hometown team, had the other assist. The Sharks kept peppering Anderson, but they couldn't get another puck past him. "We had some chances to score early on, and we felt we probably could have had a couple that could have changed the look of the game," Sharks captain Joe Thornton said. "But it seemed like they only had six or seven chances and they made good on a lot of them. For whatever reason, it just wasn't bouncing our way tonight." "It just wasn't good enough," Sharks center Logan Couture said. "The last game against Calgary wasn't that good. We have to figure out what's going on. We didn't generate much offense." Turris answered at 9:51 with a shot through heavy traffic from the left circle that beat Niemi. Defenseman Sergei Gonchar, playing in his 1,100th career game, threaded a cross-ice pass to Turris, who somehow got the puck past three Sharks in front of the crease and Niemi. Senators captain Daniel Alfredsson earned the other assist. 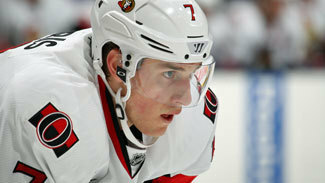 Turris had the game-winner Tuesday night against Toronto when the Senators overcame an early 2-0 deficit to win 3-2. Since coming to the Senators from Phoenix in a trade on Dec. 17, Turris has four goals and 17 points in 16 games. "The first five or 10 minutes were definitely a big storm," Turris said. "We just tried to weather it and come out of it alive, and Andy stood on his head again. It seems every game he's making saves that nobody else can make to keep us in it. We found a way to bounce back and get one and then momentum kind of shifted in our direction and we started creating chances, and Andy still played unreal." The Sharks played their second straight game without second-line winger Ryane Clowe, who was placed on injured reserve Thursday with a facial fracture and might miss the final three games before the All-Star Game break. But Desjardins, who missed two games after a shoulder-to-head hit from Columbus' Dane Byers on Saturday, returned to the lineup. San Jose also activated defenseman Colin White from injured reserve. After missing 10 games with a lower body injury, he was in the lineup in place of Jason Demers, paired with Justin Braun. Senators rookie defenseman Mark Borowiecki made his NHL debut Thursday night and drew the first Sharks penalty, in the first period, and also recorded two hits. "I thought he played real good," MacLean said. "Played with good patience, was physical when he had to be, but played within himself and didn't' try to do things that he couldn't do."